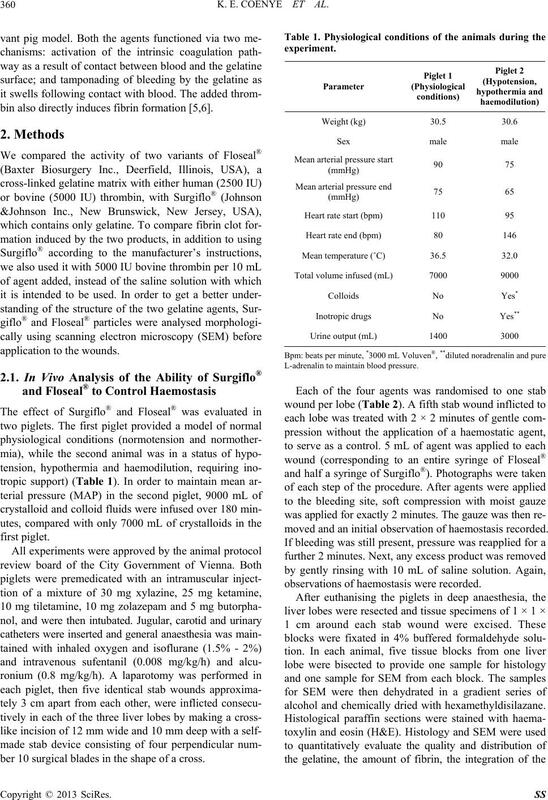 bovine thrombin), Surgiflo® and Surgiflo® plus 5000 IU bovine thrombin per 10 mL of product (n = 6 test sites/group). 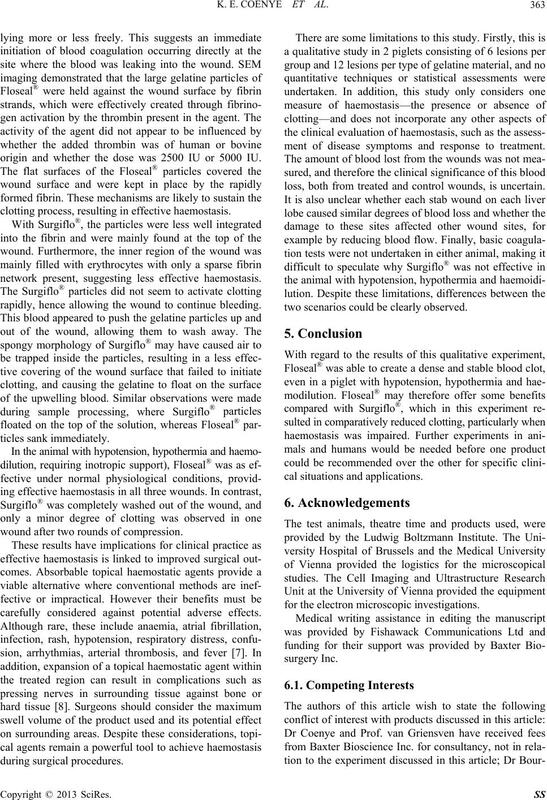 Floseal® created a dense and stable blood clot, even in a piglet with hypotension, hypothermia and haemodilution. be inorganic in nature . K. E. COENYE ET AL. 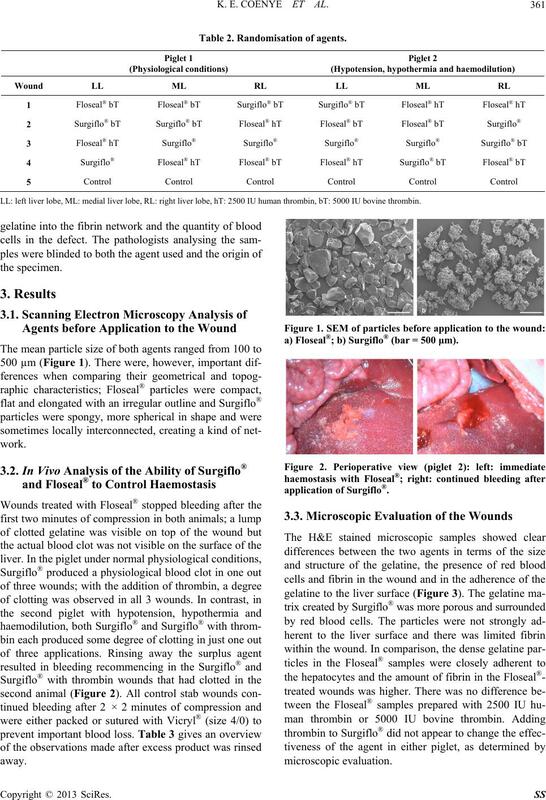 bin also directly induces fibrin formation [5,6]. ber 10 surgical blades in the shape of a cross. L-adrenalin to maintain blood pressure. moved and an initial observation of haemostasis recorded. 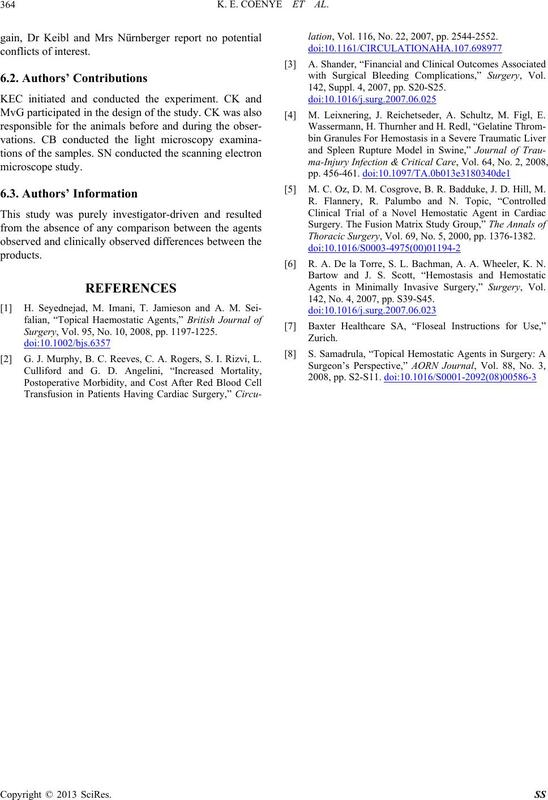 observations of haemostasis were recorded. alcohol and chemically dried with hexamethyldisilazane. Table 2. Randomisation of agents. LL: left liver lobe, ML: medial liver lobe, RL: right liver lobe, hT: 2500 IU human thrombin, bT: 5000 IU bovine thrombin. a) Floseal®; b) Surgiflo® (bar = 500 μm). Table 3. 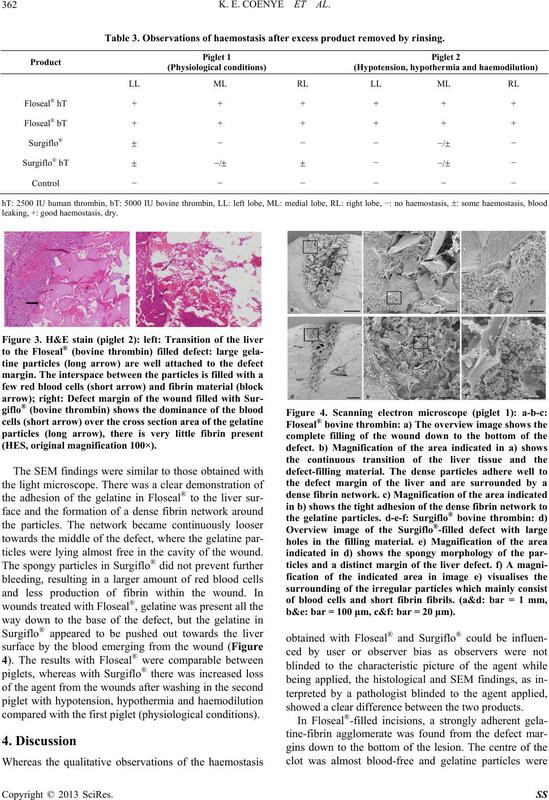 Observations of haemostasis after excess product removed by rinsing. leaking, +: good haemostasis, dry. ticles were lying almost free in the cavity of the wound. compared with the first piglet (physiological conditions). b&e: bar = 100 μm, c&f: bar = 20 μm). showed a clear difference between the two products. origin and whether the dose was 2500 IU or 5000 IU. clotting process, resulting in effective haemostasis. network present, suggesting less effective haemostasis. rapidly, hence allowing the wound to continue bleeding. wound after two rounds of compression. carefully considered against potential adverse effects. ment of disease symptoms and response to treatment. loss, both from treated and control wounds, is uncertain. two scenarios could be clearly observed. for the electron microscopic investigations. Surgery, Vol. 95, No. 10, 2008, pp. 1197-1225. G. J. Murphy, B. C. Reeves, C. A. Rogers, S. I. Rizvi, L.
lation, Vol. 116, No. 22, 2007, pp. 2544-2552.
with Surgical Bleeding Complications,” Surgery, Vol. 142, Suppl. 4, 2007, pp. S20-S25. M. Leixnering, J. Reichetseder, A. Schultz, M. Figl, E.
 M. C. Oz, D. M. Cosgrove, B. R. Badduke, J. D. Hill, M.
Thoracic Surgery, Vol. 69, No. 5, 2000, pp. 1376-1382. R. A. De la Torre, S. L. Bachman, A. 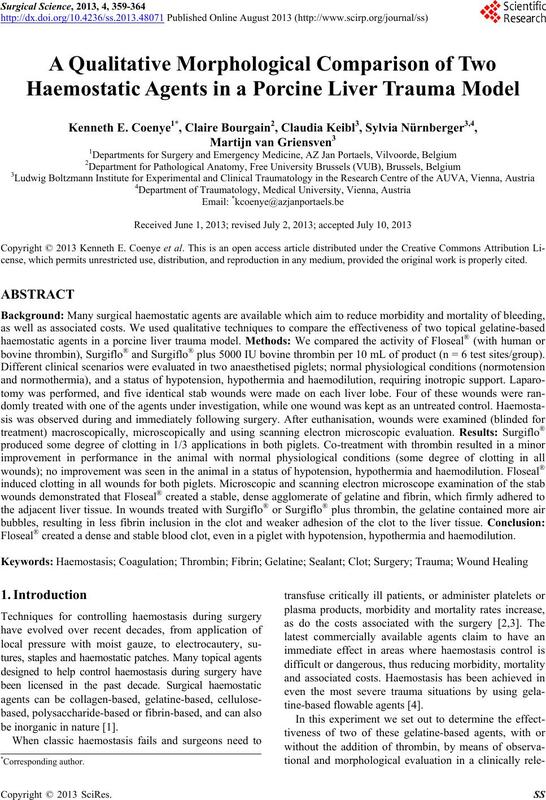 A. Wheeler, K. N.
Agents in Minimally Invasive Surgery,” Surgery, Vol. 142, No. 4, 2007, pp. S39-S45.